Christmas love lingers, from our house to yours.. I have been thinking about you and praying for you, since the calendar turned and we entered 2017. Oh my goodness, here we are. A new year…time to reflect, however briefly, on our life, relationships, disappointments and joys. I pray you are well and ready to embrace your life! As it turns out, our Christmas included hours and hours of focus on tiny little jigsaw puzzle parts. Bodies leaned over the table, stretched out on the floor – bodies returning as if the puzzle had a gravitational force. This firsthand witness of the puzzle’s lure captures the experience of writing my book. I get lost in hours of writing as my family got lost creating Stuttgart’s Schlossplatz and a colorful Charleston house. And yes, a difference between us is the picture they could check to complete the puzzle. My project is more open-ended, which feels a little daunting. But there are similarities, as well. Each piece is sorted according to color, or in my case, theme. The outside edge or organizing structure is the first task to accomplish. And help is always valued! But there is one more similarity I noticed, the lure of love. All the combinations of family members working together on the puzzles created a sacred space. Time and effort became a shared memory of just being together, of loving each other. My writing is a very solitary experience. Some days a candle provides a focus or Facebook, a distraction. But I keep returning, I keep seeking new ways to explain my thoughts on the sacred art of grieving. I too have been lured by love and I am trusting this call to share the light of Love as I know it. When I sit down to write, I bring the faces and hearts of those who have shared their stories with me. I see the images of love that they described and try to capture their wisdom. 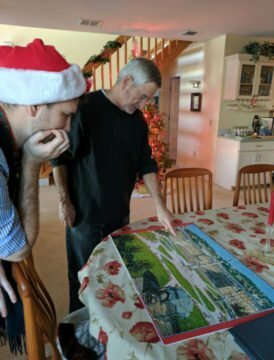 I’ll keep you posted, friends, in the meantime, I’m so grateful for my family, their excellence in jigsaw puzzles is keeping me going!